Visual Impact Now is an official 501-c3 organization founded with the goal in mind that “Every child deserves the gift of sight.” Visual Impact Now has served as a fundraising and awareness arm for their partners One Sight, providing free eye exams and glasses to children and families unable to afford it. This includes LA School District 1&2, 6&7 and the Boys and Girls Club of Hollywood. Every year Visual Impact Now hosts the LA Eye Clinic, enabling over 1,000 lower income children to be provided with eye care. 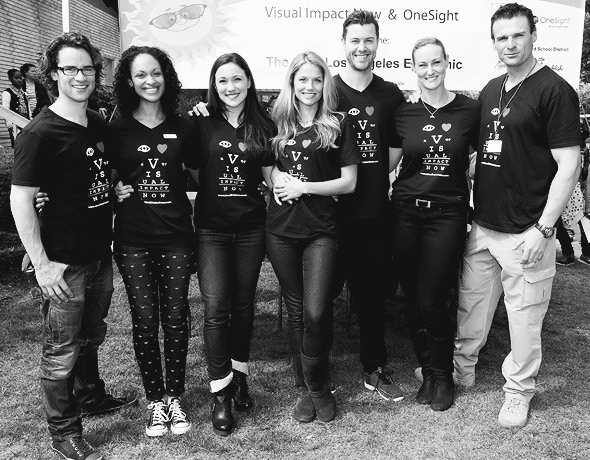 Visual Impact Now has been the key non-profit for events such as the Golden Globes Style Lounge, Coachella, LA Fashion Week and Sundance Film Festival as well as numerous holiday, fundraising and awareness events. Visual Impact Now’s Host Committee Members and supporters have included Olympic Gold Medalist Shaun White, Chris Pine (Star Trek), Debra Messing (Will & Grace), Zoe Saldana (Avatar), Malin Akerman (Watchmen), Robert Luketic (Director, Legally Blonde), and January Jones (Mad Men) to name a few. Visit Ellen’s non-profit organization at visualimpactnow.com to learn more. Visit our gallery for over 10,000 photos! "To see the leaves on a tree, a bird fly, or a mother's face from across the playground is a privilege tens of thousands of our underprivileged Los Angeles Youth don't have. Until now. Visual Impact Now seeks to give all disadvantaged children in Los Angeles the privilege they deserve... The Gift of Sight." Ellen Hollman Web is the official fansite of Ellen Hollman, dedicated to supporting and promoting Ellen's career. No copyright infringement is intended through the use of content on this website. Any photos, videos, and articles posted on this site are copyrighted to their rightful owners and are used solely as promotional material. If you want anything removed, please feel free to contact us at any time!